Hello. 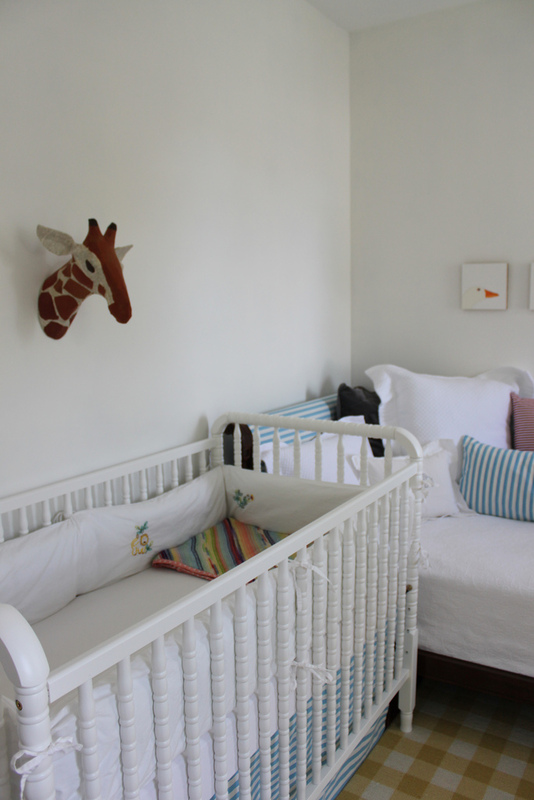 And a nursery tour. I know I haven't posted anything in a while, but there is good reason. 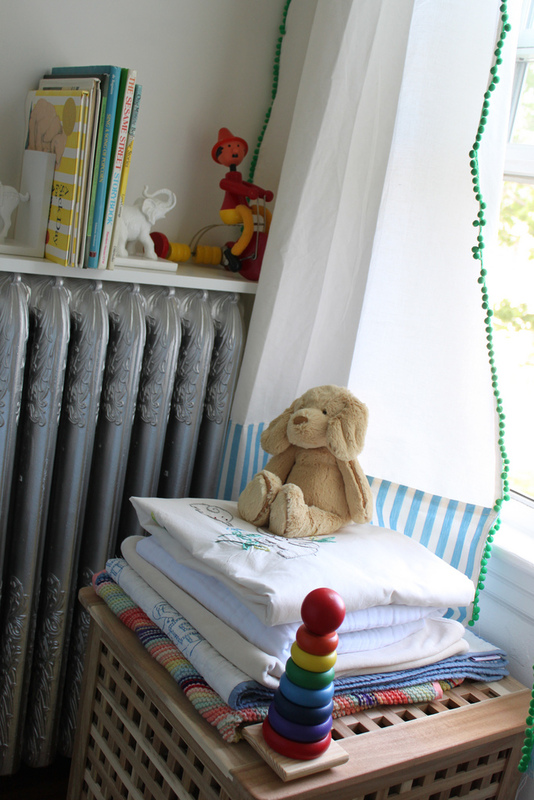 And look ... our apartment has a nursery now! 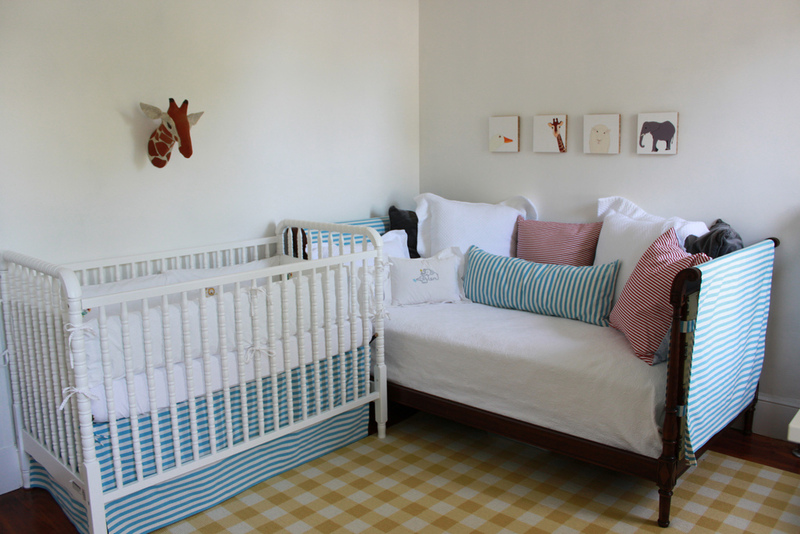 It will be occupied by Baby P very soon--as in days--but before it is, here's a tour. Here's a view from the door. I made the curtains using two pairs we had hanging in the dining room of our old apartment. I cut a few feet of fabric off the bottom, and added panels of blue and white fabric. On the wall opposite the windows is the crib (Jenny Lind) and a twin bed that we filled with pillows to make it a comfortable lounging spot. 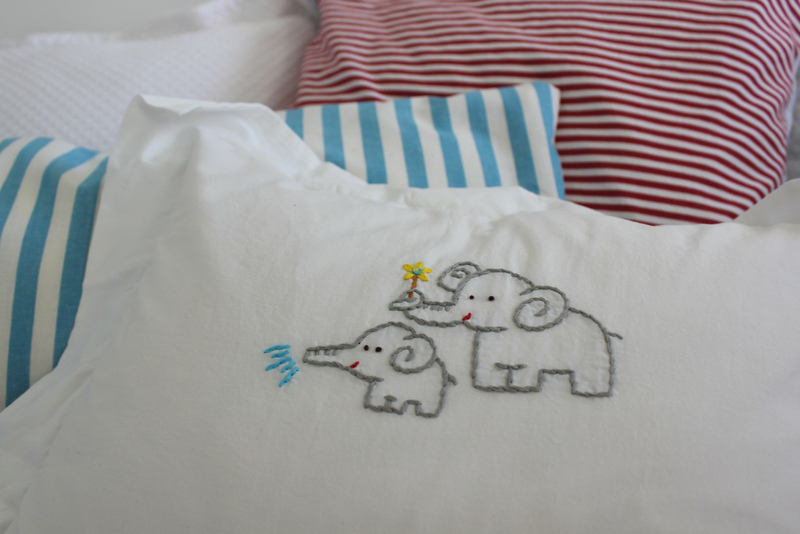 The pillow cases are a mix of handmade ones (I'm still learning. Mostly winging it) and matelasse shams from Homegoods and Amazon). 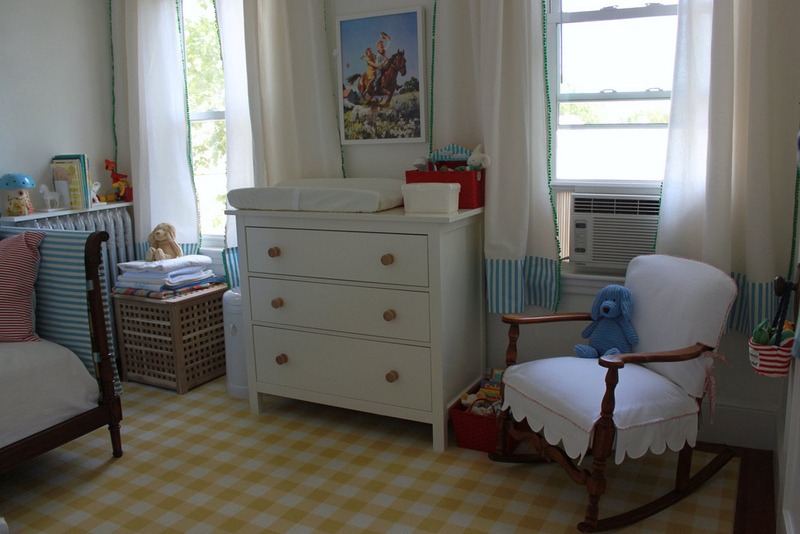 The slipcovers on the bed and the crib skirt match the fabric on the curtains. I love stripes. You should see the stacks of baby clothing that have accumulated. Stripey delight. It's a sickness. 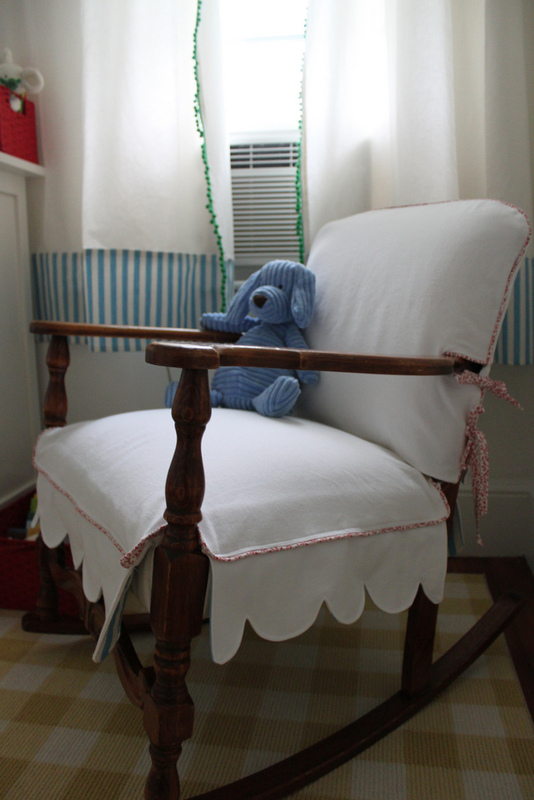 The elephant sham is part of the Coyuchi "George" line, which is also on the crib bumper. Here's the fourth wall: home of the door to the most narrow and unusable closet in the universe. 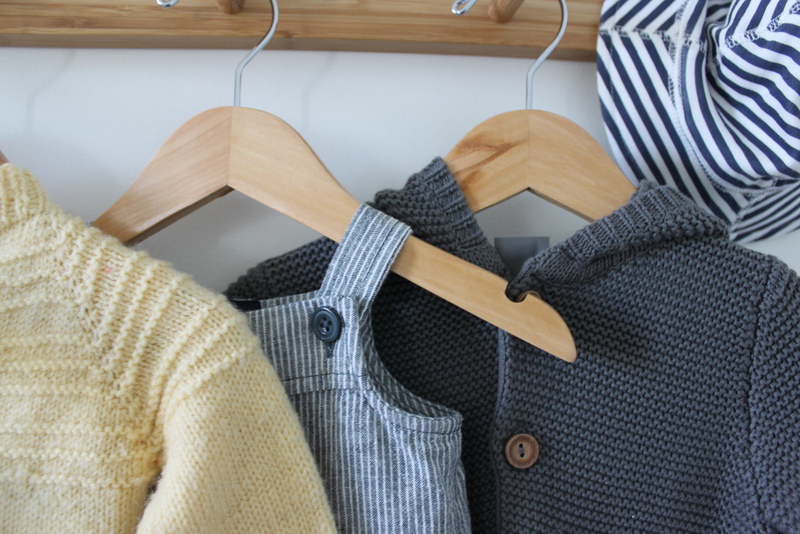 We hung some bamboo hooks to showcase some cute little outfits. Actually, the yellow sweater in the middle was mine when I was little. My grandma made it. The sweater is just one small handmade element in the photo, though. Here's the real show-stopper! My mom found this antique rocking chair at a flea market in Denver. She reupholstered it, and then made a slipcover for it. I love the scalloped edge along the bottom. It's hard to see this detail in the picture, but the underside of the skirt is lined in the same blue and white striped fabric. In the background, you can see another detail on the curtains that I didn't mention above: a green pom pom trim. Here's another view of the crib. In this picture, you can see the blanket my grandma made for my sister when she was born. Does 1979-80 qualify as vintage? 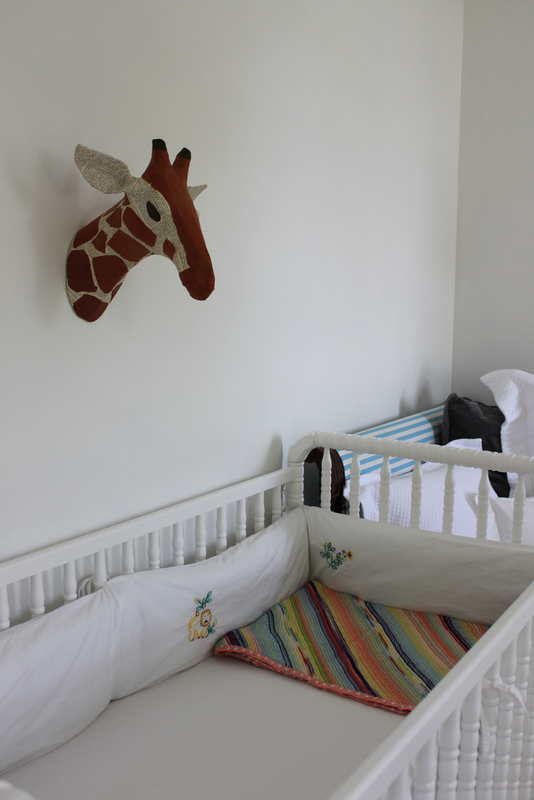 The paper mache giraffe bust is from Anthropologie. In this picture, you can see the green pom poms on the curtains up close. The wooden storage cube is from Ikea. The shelf in the back just rests on the radiator for now. I didn't want to hang the shelf on the wall unless I could do it right, and I was hesitant to put huge holes in the walls of our rental apartment (especially not knowing how much longer we will be here). Here's a good view of the animals on the crib bumper. 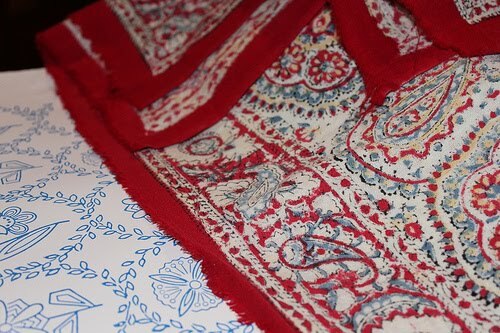 I love the delicate colored embroidery on the crisp white cotton. 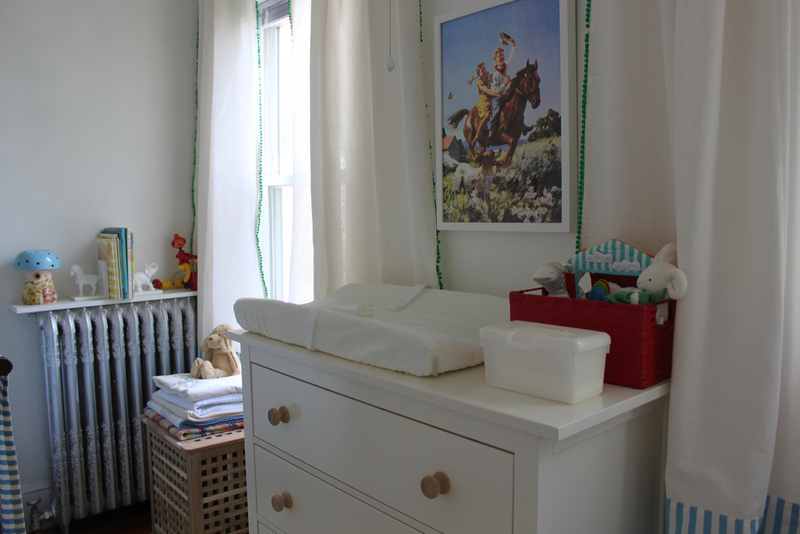 And, the Ikea Hemnes dresser, serving time as a changing table. Diapers and other supplies are in the top drawer, while the other two drawers are devoted to clothes. Instead of using the knobs that came with the dresser, we went with chunky wooden knobs. 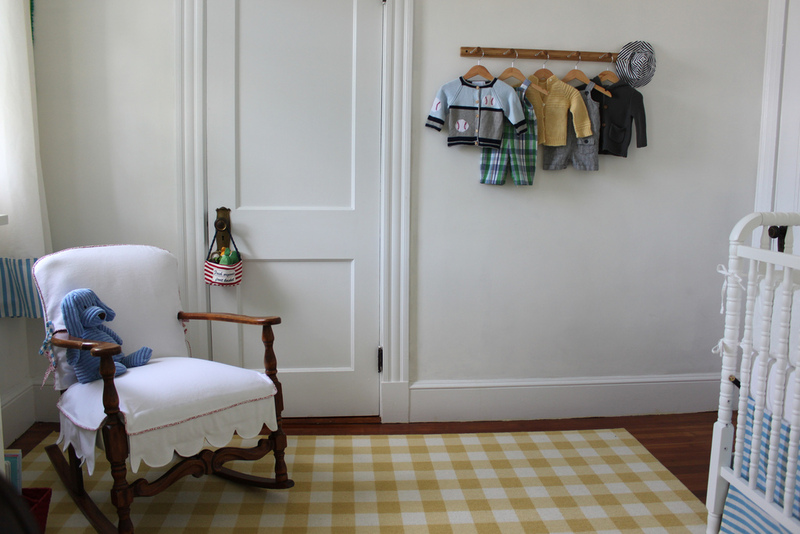 Who needs wall art when there are cute baby clothes to put on display? Yay, I have Columbus Day off. We celebrated by picking up the ottoman cushion (my mom helped reupholster the base during a recent visit, and it's been waiting naked for too many weeks for its top.). I won't let the day go to waste, but before I start Operation Clean, I had to put my feet up and give it a true test. No need to watch TV, though. Our neighbors seem to be installing an inflatable graveyard next door, complete with ghosts hanging in the trees. Far more interesting to watch. If Operation Clean is a success, I'll be back later with more pictures of the living room. 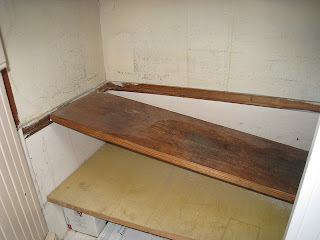 In case you missed the post about my pantry, click here to read about how the linoleum counters in the pantry made me squeamish. In that post, I didn't even mention what it looked like underneath the counters. It was nasty. So nasty that I honestly doubted we would store food under there. I thought it might be good for cleaning supplies, in a sealed container. Clearly the landlord didn't touch the pantry when he was renovating the rest of the apartment. Have you ever hear of Kilz? It's a primer that supposedly neutralizes odors and other gross germs and things that you don't want to spend too much time thinking about. 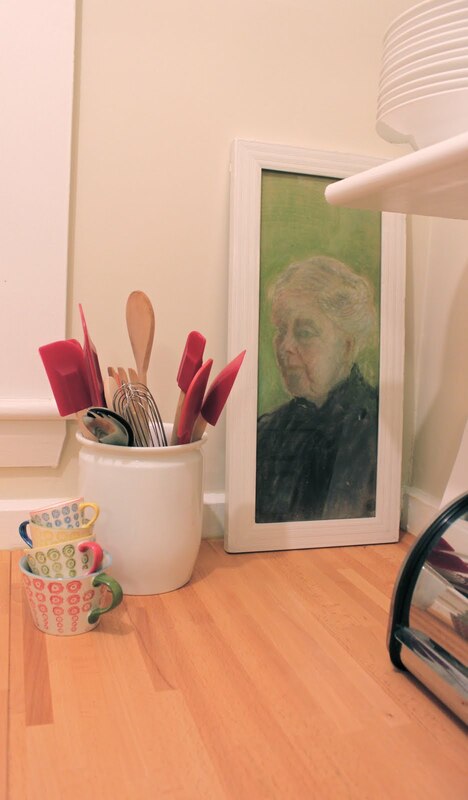 I ended up sweeping and vacumming and scrubbing underneath the pantry, and then painting it with one or two or even three layers of Kilz. And the end result? Not bad at all. It feels fresh and -- dare I say? -- new. We keep the dry goods on one side. 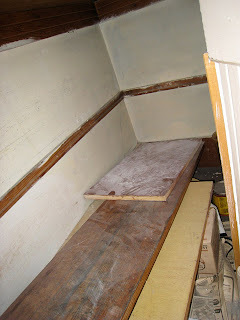 There were some shelves already in there, which you can see in the pictures above. Yeah, they got a lot of paint. On the other side, we keep extra plates, serving platters and random kitchen things. The lower half is not as pretty as the upper half, but hey, it's not to be overlooked! 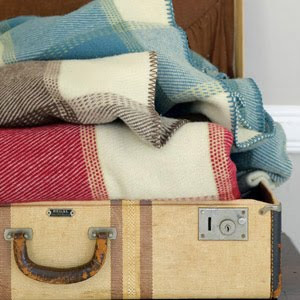 A good reason to go to London would be to see this blanket in person. I'll take one in red, please. I should probably take the suitcase, too, since I'd also like to bring back these sheets. Labor Day has come and gone, but today is the first official day of the fall. My scarves are set and ready for their prime season. They used to reside in a basket, but I like seeing them arranged in a more orderly fashion. 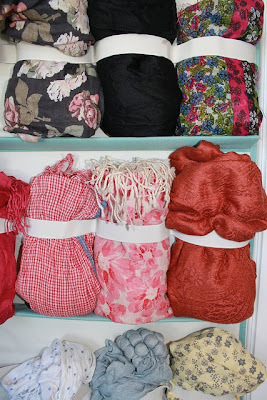 So, I rolled them up and tucked them into an over-the-door shoe organizer we had lying around. I love seeing the colors displayed like this. It's tempting to move the organizer to the outside of the closet door. The summer of 2010 was one of the best I've ever had, and it's sad that it has come to an official end. 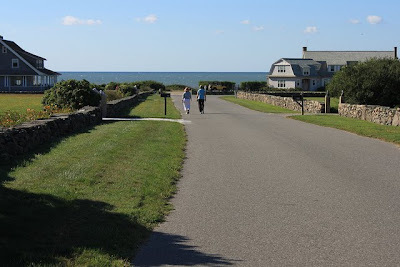 Oh, we had walks by the beach (in Little Compton, Rhode Island). And we cooked more than ever. No frozen meals, which were a former staple in our house. All in all, a pretty good prelude to Fall. The pantry was one of my favorite things about our new apartment, even though it needed some work. That's linoleum tile on the countertops. It really didn't inspire me to prepare any food. 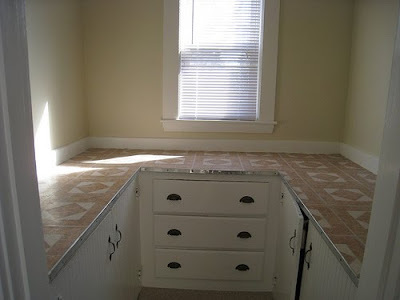 And while I could think of lots of amazing things to do with this pantry if we owned this apartment, we had to use some restraint when it came to actually making the space usable as renters. And here's the after! 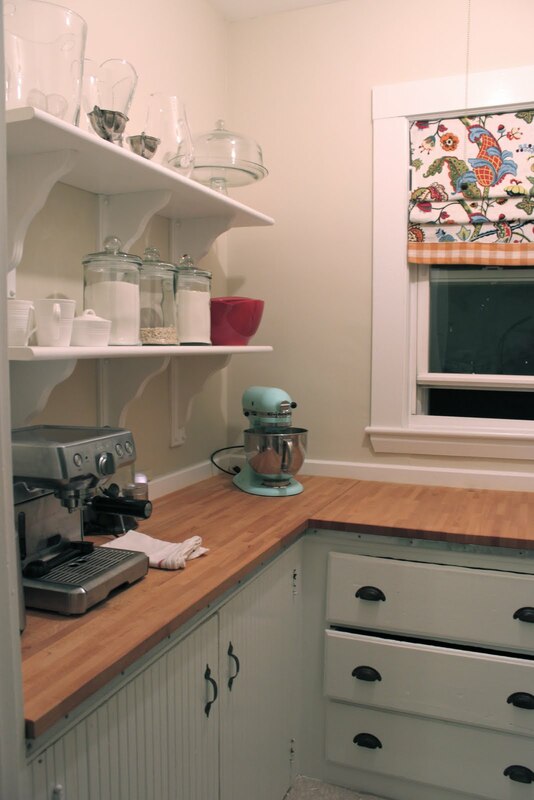 We covered the tile countertops with ikea butcher block -- it's just sitting on top, not attached in any way. 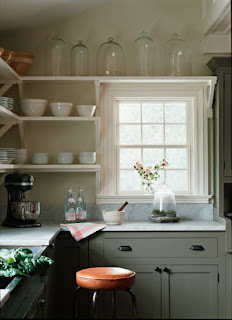 When it's time for us to move in a few years, we'll have the option of taking the butcher block with us. It's in big enough pieces that it could be repurposed. We wanted to make sure the shelves were sturdy enough to hold plates or appliances or anything else we might want to put on them. The linoleum tile that I could barely make myself touch before has been transformed into the most charming prep space I've ever had. I enjoy making espresso in the pantry every morning. It's so cozy, and I love to bustle around making breakfast and packing my lunch. 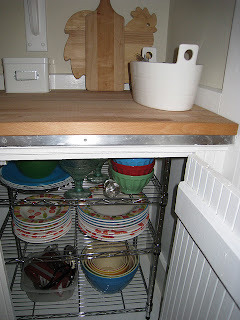 Grrr, but now I'm staring at the picture above because the middle drawer is open slightly. Why didn't I fix it? 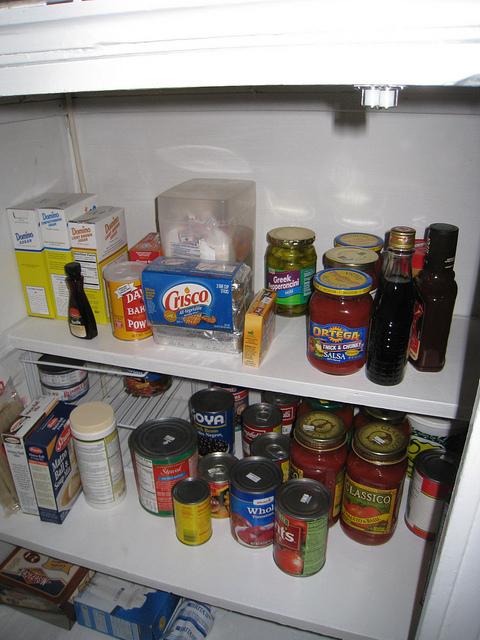 I'm too lazy to do it now, but I'm sure the pantry will be restyled soon. I'll make sure the drawers are closed next time. I got the chalk drawing at a barn sale in Maine a couple of years ago. 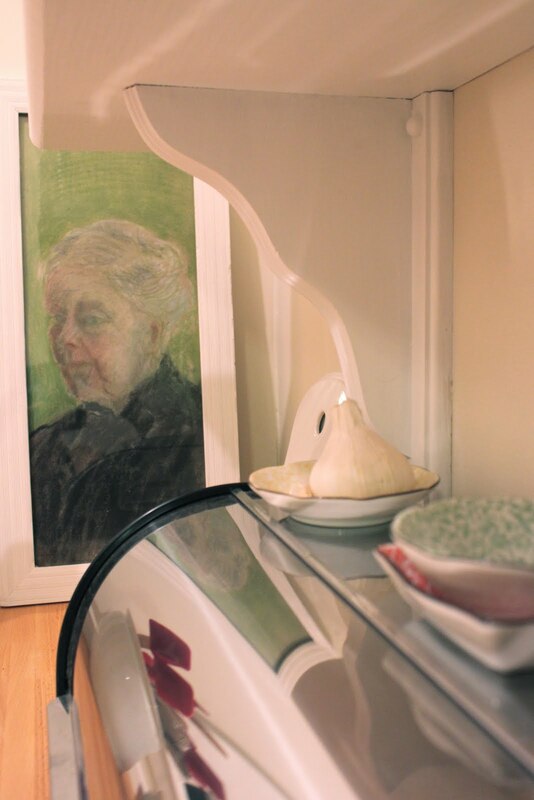 The old lady in the picture looks friendly for the most part, but now that she resides in the pantry, I've noticed her looking more stern. I think she wants me to make some whoopie pies! See how she's eying those spatulas? I went to Brimfield last weekend. Brimfield comes three times a year: May, July and September. The last one is my favorite, because I think you can get better deals. Plus the September weather usually beats July or May. I don't really need anything. 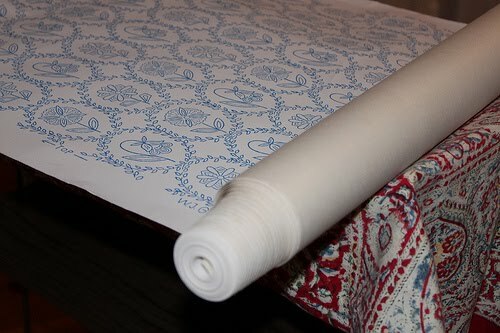 Especially not four rolls of vintage wallpaper. But I love the pattern, and before I knew it, it was mine. I also got this tapestry. Or maybe it's a tablecloth. Whatever it is, I like the rich colors. Plus, paisley is one of my faves. Pretty sure this wallpaper is going to make like my blog name and be filed for later. It's too good to waste on something less permanent than a wall! I like to read about decorating and interior design. I can't live out my decorating fantasies yet (not in a rental apartment! ), but this is where I keep the images and ideas that inspire me. 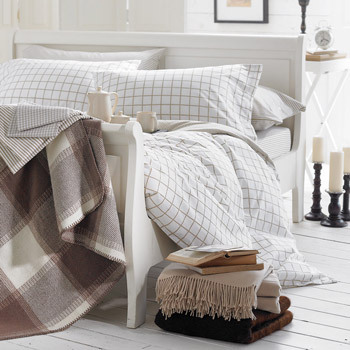 City apartments, rural farms, and everything in between. I save everything I like, because who knows where we'll end up! 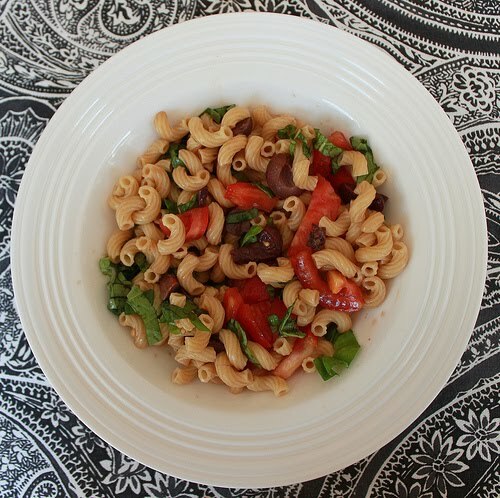 Go to the new blog!